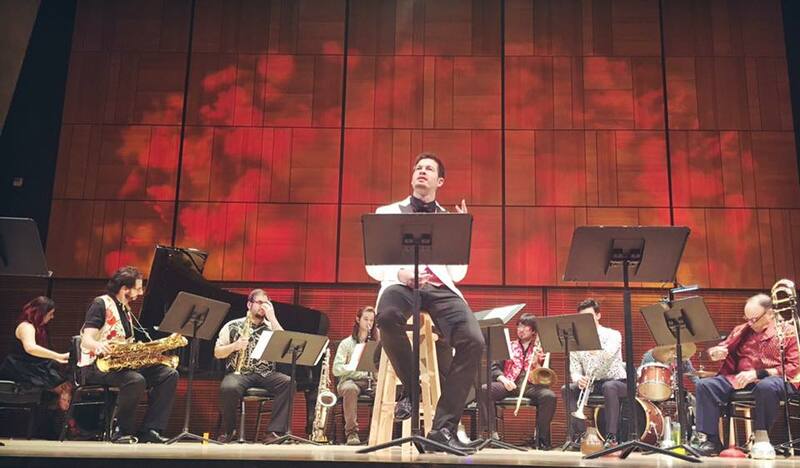 The Eco-Music Big Band kicked off with a tour through Vermont and NYC in February of 2014. Overnight, I found myself at the helm leading 15 world-class jazz musicians in an avant-garde, cross-genre big band that could and would play anything. I had no idea what I was in for, but I fell in love with the three hundred and sixty degree view of my new ensemble: raising money, booking gigs, hiring musicians. From early on, I recognized that my band was a business, and I insisted that the musicians that play in the band treat it as such. The jazz economy can be sparse and frightening: lots of musicians and lots of bands all competing for stage time in the clubs whose names bring clout but often not much money or audience. I heard war stories from the gigging sidemen in my band of playing 3 gigs a night for a cut of the meager door admission. When my ensemble dipped its collective toe into that market, I immediately decided that I wanted more for my misfit band: we weren’t a traditional jazz band, by any means, so I hoped that I could find some non-traditional performance opportunities for us. If we were toeing the line artistically, maybe we could go to the venues that jazz bands traditionally didn’t. We had a couple of lucky breaks: a few years in a row on BAM’s Next Wave Festival, a feature on the American Composers Orchestra SONiC Festival, and a few performances a year at the amazing Joe’s Pub, which continues to be a lovely home for us from time to time. I managed to accrue relationships with some amazing collaborators who had great ideas that propelled us forward. And we failed. A LOT. It’s Albert Einstein who said that a person who never failed never tried anything, and my band put that theory to the test. There was the performance where we almost got banned from the venue because a musician was sexually harassing female staff (and yes, I put a very swift and stern stop to it); the recording gig that almost got cancelled a few weeks beforehand because we lost funding; the time I walked in on a musician loudly telling the rest of the band that I didn’t know what I was doing; gigs where there were more people on stage than were in the audience. And yet: the highs were undeniable. We commissioned music by living composers; performed high energy shows; recorded two great albums; started to dip our toe into the theater world. In three years, my musicians were able to go from getting paid $50 for a performance to being paid 5-10x that much. On June 3, 2017, the Eco-Music Big Band played in Carnegie Hall’s Zankel Hall. We were a relative nobody as far as big bands go, so I rented the hall for the evening and rallied the band. It was a feat of Herculean strength: there was a 5-figure sum of money to come up with before I could even think about paying my musicians. My creative team and I toiled day and night; we saw many almost-fails; we sent more cold fundraising emails than I’d like to admit. And yet, on the evening of the performance, things happened as seamlessly as if I had orchestrated it in my dreams. There’s an old joke: How do you get to Carnegie Hall? Practice, practice, practice. But the reality is that just practice is not enough. These days, the arts, like any field, requires an entrepreneurial spirit. I learned so much in the experience of scaling my business model – here are the 3 main lessons I walked away with. 1) SCALE YOUR CAPITAL AND GROW YOUR TEAM. If you are able to raise enough capital to pay your people $50 a night, what will it take to get to $100? And then $200? And then beyond? Assess how you are spending your time, who is on your team, and how you can get the support you need. When I started, three years ago, I was on my own, and the team that I built enabled me to have the support I need when we do large scale projects. The two go hand in hand because the bottom line is this: everyone needs to be compensated. If you can offer a well-paid AND career-promising opportunity, your people will appreciate it. Take steps and grow with each project, and your team will be behind you for the next opportunity. 2) TALENT IS KEY. Artists are solitary, and networking can be a challenge. But the truth is that I couldn’t have done it without the people that I work with. This is true in any collaborative situation: hiring the right people can mean the difference between success and failure in any creative or business endeavor. I’m heavily introverted, so it can be hard for me to reach out and make new business connections, especially when things are good in my current projects. I can trace my business relationships across several points and see where they came from, though, and it helps to understand that to see the importance of networking. My favorite example goes like this: my teacher, Fred Ho, worked with the great bass trombonist, David Taylor. David Taylor and I loved working together and continued to after Fred passed, and his student (and my former classmate), David Whitwell, joined the band a year later. David Whitwell brought a number of incredible collaborators into our space, including the actor, writer, and beat poet scholar, John Palladino (pictured front and center above). The collaboration with John was the project that enabled us to scale our endeavor to Carnegie Hall: a jazz retelling of the Faustian L’Histoire du Soldat, by Igor Stravinsky. Working with each of the above mentioned folks changed our trajectory in different ways. 3) YOUR WILDEST DREAMS ARE WHAT SETS YOU APART. Have you heard of an opera featuring a drag queen male soprano who also plays trombone? Or a beat poet retelling of an early 20th century work? Or a concerto for baritone saxophone and orchestra? We hadn’t either – but this and more was what made it to our Carnegie Hall performance. Our craziest ideas were what filled the seats. Where else could one go to see all of the above? I’m grateful to have learned all of these lessons (and more) from my experience in bringing the Eco-Music Big Band to Carnegie Hall for the first time. I’m happy to be able to apply my newly applied skills in all areas of my post-Carnegie life – including in my social media and publicity business.